Summary: When Griffin’s first love and ex-boyfriend, Theo, dies in a drowning accident, his universe implodes. Even though Theo had moved to California for college and started seeing Jackson, Griffin never doubted Theo would come back to him when the time was right. But now, the future he’s been imagining for himself has gone far off course. 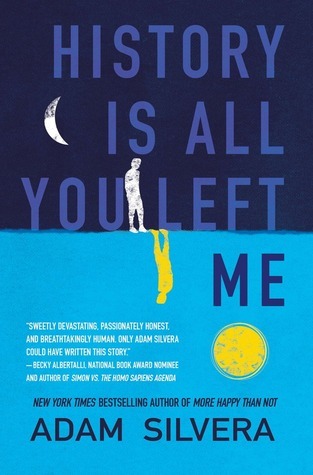 Review: Adam Silvera made me cry again. He is good at making tears roll down my face (see my review of More Happy Than Not for evidence). This is definitely an emotionally packed novel and had my heart breaking right along with Griffin’s. Readers meet Griffin in the midst of grief. Fortunately, we don’t stay there mired in grief though. That would likely be overwhelming. Silvera made the choice to alternate chapters between the present and the history of Griffin and Theo’s relationship. Their friendship and romance are not always without pain, but at least in the beginning, those history chapters offer humor, love and hope. This balances out the heartache of the other chapters to a certain degree. It highlights how much of a loss Griffin is dealing with too. Griffin isn’t only facing grief, but throughout all of the chapters, both past and present, he is dealing with an increasing anxiety about his compulsions. One example is his counting. He counts things and is incredibly uncomfortable with odd numbers. Uncomfortable is not even a strong enough word. With all of this going on, he starts to make some damaging decisions that are painful to watch. The characters in this novel were all too real for me and I wanted to jump into the story to offer comfort. This story obviously focuses on navigating grief, but it also looks at some other aspects of simply being human. How much of ourselves do we show other people? How honest can we be with others and with ourselves? Recommendation: Get this one soon.